Heard: A military-grade, mega-dosed multi-ingredient natural anabolic is undergoing development, and it’s slated to be the most potent natural anabolic made. Sources have told us that Assault Labs, the company responsible for the strongest test booster available today, is currently tackling the formulation of a natural anabolic. 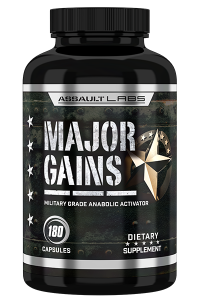 Customers have seen such incredible results from Sergeant Steel that they have been beating down the doors at Assault Labs for more, and this latest innovation, working title “Major Gains,” looks to be the answer (looks like Major Gains is going to be the official name). Assault Labs has become synonymous with fully-loaded performance supplements, and despite the recent surge of reformulated natural anabolics to hit the market already in 2018, they believe their multiple-compound Major Gains will help customers realize their full potential. Coupling several familiar ingredients with some used by the Russian military during wartime, Major Gains looks to bring an exciting new formula to the market. Established ingredients include Laxogenin, a plant-based compound known for its impact on protein synthesis and cortisol control, and Ursolic Acid, a recomposition compound that in one study showed a 413% more lean mass gain and 5lb fat loss in athletes compared to a placebo group (1). We are told that Major Gains may also include Phosphatidic Acid, a phospholipid which can help increase mTOR up to 6 times, and a study showed users gained twice as much muscle and improved strength by 60% when compared to a placebo group (2). But perhaps the most interesting ingredient we have identified is Maral Extract 4:1, another plant-based compound that was used by the Russian military in WWII to help soldiers recover strength faster. In studies, this compound, also known as Russian Leuzea, improved the working capacity of athletes by 10-15% (3). It has also been associated with adaptogenic and anabolic properties, suggesting that it can affect not just recovery, but also hypertrophy. Major Gains paired this with HICA, a leucine metabolite, a one-two punch shown to improve recovery through increased protein synthesis (5). While we don’t have an exact release date as of yet, we expect Major Gains to head into the testing phase shortly, meaning it will hit the market relatively soon. Subscribe to updates from Strong Supplement Shop to be the first to know when we get more information about Major Gains and other new products. Love Sergeant Steel. Looking forward to this! Hi Jake – Thank you for your comment. Us too – Apparently Major Gains is being built in the same vein as Sergeant Steel, Assault Labs wants to be the potency leader. Stay tuned we’ll keep you posted. Hi Zach – Thank you for your comment. Just click the button at the top of the article or SIGN-UP here and you’ll be the first to know when Major Gains is released. Sign-up, stay tuned and we’ll keep you posted…we’re really excited about this one. Hi Donovan- Thank you for your comment. Actually Major Gains is expected to be quite a bit different than Massacr3. It is slated to include all the ingredients of Massacr3 and then some. Most notably it contains a new compound Phosphatidic Acid, that has been University studied and I believe shown to increase muscle mass 47% and strength 60% more than the placebo group. We won’t know for sure what Major Gains Ingredient Panel looks like until it is release, but the manufacture is set on making this the most powerful natural anabolic made. Major gains… Sounds dope to me… Sergeant steel is a beast of its own but I’d love to see what this is going to be like. Curious if it could be stacked with vector. Hi Jordan- Thank you for your comment and question. Major Gains is being designed from the same mold as Sergeant Steel – We’re really excited too because it gives our customers a very potent anabolic supplement, that is all natural too. You could stack Major Gains and Vector if you wanted but why would you, your best approach might be to cycle them alternatively; 30-60 days with Major Gains and the next 30-60 days with Vector. Always looking for a stack to push me further but I just may. Hi Russell – Thank you for your question. That is a heck of a stack already, I would say that Vector would be “overkill”. Vector is quite about different than anything you have in your stack now, so it would probably be a better idea to do a follow on cycle in month 2 with Vector.